Bullion giant Goldcorp Inc. says it will halt exploration spending in Argentina after the government imposed export duties on metals production, reversing a pledge to keep miners' tax rates stable for 30 years. Vancouver-based Goldcorp owns a 37.5-per-cent stake in copper and gold mine Alumbrera, the largest mining operation in Argentina. In late December, the Argentine government stunned the country's burgeoning mining industry, slapping a 10-per-cent tariff on base metals exports and a 5-per cent-levy on gold production, seeking a larger slice of miners' profits from record metals prices. In retaliation, Goldcorp has decided to put exploration efforts in Argentina on hold. "I have already taken Argentina from the 2008 list of places I am going to go," Tim Miller, Goldcorp's vice-president in Central and South America, said in an interview. "I have put it on hold. There are other places that are inviting foreign development and investment much more than Argentina," he said. The surprise export duty has threatened Argentina's rapid ascent (descent?) as a destination for the world's mining industry. In search of the next metals hot spot to rival Chile or Peru, international mining firms have flocked to Argentina in recent years, spending billions on exploration and mine construction. Mining investment in Argentina has increased to $1.77-billion (U.S.) in 2007 from $220-million in 2003. The country promised 30 years of tax stability to mining companies in 1993 and issued exemptions from export duties imposed during the country's financial crisis in 2002 to mines already in production. Now some of the world's largest mining companies have filed a legal action against the government in a bid to fight the new duties. Xstrata PLC, which controls and operates Alumbrera, Rio Tinto PLC, the owner of a borax mine in Argentina, and AngloGold Ashanti, which has run the Cerro Vanguardia gold mine since 1998, are seeking an injunction preventing the government from collecting the new tax. "We continue to be hopeful we will reach a solution through dialogue with the government respecting legislation currently in effect but, in the meantime, it has been necessary for us to protect our short-term interests and we had to commence legal proceedings," Xstrata spokeswoman Emily Russell said. Some miners in Argentina were already paying the duty. Barrick Gold Corp., the world's largest bullion producer, operates the Veladero mine in Argentina and has been paying a "temporary" 5-per-cent export duty on gold production since 2005. Barrick, which is developing the massive Pascua Lama project that straddles the Argentine border with Chile, is not involved in the litigation and is "monitoring" the situation, a company spokesman said. 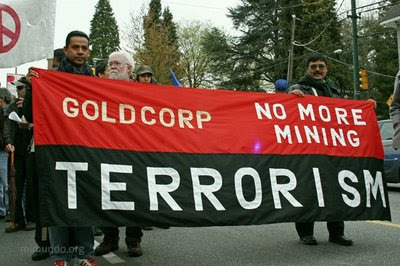 Goldcorp does not have any major exploration operations in Argentina. However, the country "was high on its list of countries we would like to expand into," Mr. Miller said. Exploration around the Alumbrera concession by the mine's partnership has also been put on hold, the Goldcorp executive said, delaying "millions of dollars from being spent on planned exploration." Goldcorp has lobbied Ottawa for help and hopes the export tax issue will be raised by MP Ted Menzies in meetings with Argentine officials in Buenos Aires this week. Toronto's Yamana Gold Inc., which owns 12.5 per cent of Alumbrera and is developing the Gualcamayo mine and several other projects in Argentina, is also watching the situation closely. "To have sustainability for mining you have to have certainty. You can't change the rules midstream," Peter Marrone, Yamana's chief executive officer, said in an interview.